Glam up those dowdy trainers and give your exercise routine a boost! In a mixed shade twin pack, Elle Cushioned Trainer Liner Socks, with gorgeous, fluffy Pom Pom details at the back ankle, bring the joy to your jog and the pretty to your Pilates. The socks are made in a softly marled yarn, for delightfully muted shades. 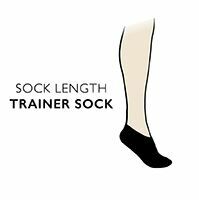 Of course, you don't need to hit the gym to wear and enjoy these below ankle socks, softly lined from cuff to toe with brushed loop pile cushioning, they’ll deliver a hit of style and a bit of comfort whether you’re building up a sweat running, trawling the shops or just lounging around at home. Available in a selection of seasonal, fashionable colour ways.